If Ethan Brown gets his way, within the next few years, his now-tween kids will drive themselves to McDonald’s, Burger King or Wendy’s to order a plant-based burger made by his company, Beyond Meat. Brown, who had worked in the energy section developing proton-exchange membrane fuel cells, founded Beyond Meat in 2009 to present consumers with a good alternative to meat to solve one of the biggest problems facing the world today: climate change. That’s based on the fact that one of the biggest choices an individual can make toward helping the planet isn’t buying an electrical vehicle, but cutting down their consumption of animals. (There was a record 99.7 billion pounds of red meat and poultry produced in 2017.) It’s a topic Brown had been intimately familiar with, as he spent part of his youth helping his dad on the family’s Maryland milk farm. He considered three options for his new venture: lab-grown meat, in vitro meat and processes that organize protein from plants to make food that feels like meat. He decided on the latter, because he felt it would scale better and be more palatable to consumers. He came across U.S.DA-backed research from two University of Missouri professors that reset the protein from plants to take on the muscular form of meat. After working with the now-retired researchers, Fu-hung Hsieh and Harold Huff, for a couple of years, Brown “exhausted every resource” he had to license the technology to start the company. After years of experimenting with the process on imported plant protein from Taiwan, the company released its first product, Chicken-Free Strips, which landed on the shelves of northern California Whole Foods stores in 2012. 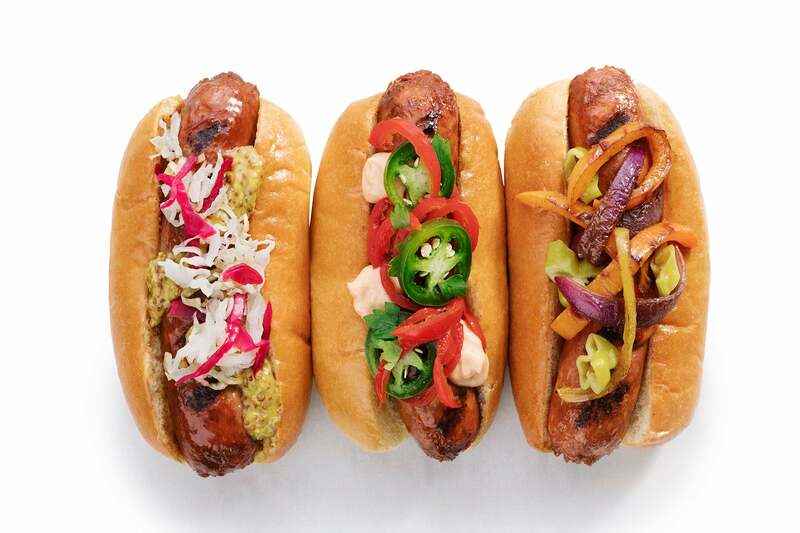 The product proved to be a hit, and started selling in other Whole Foods regions. 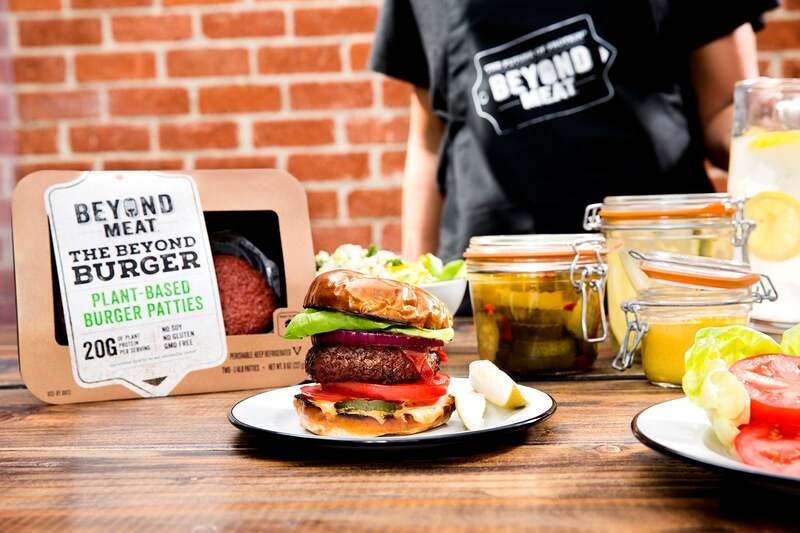 Now Beyond Meat’s product offerings include a plant-based beef crumble, burger and a sausage, which debuted in December. The company has caught the eyes of big-name investors, including Bill Gates — who wrote he “couldn’t tell the difference” between Beyond Meat and real chicken — Twitter co-founders Evan Williams and Biz Stone, venture capital firm Kleiner Perkins and Tyson Foods, which purchased a five percent stake in the company in 2016. Its latest funding round, in December, was for $55 million, bringing its total amount raised to $72 million. 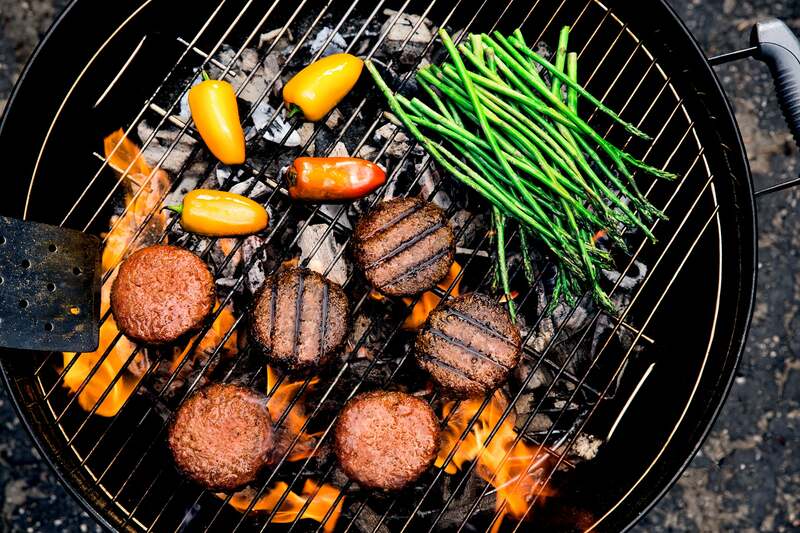 Beyond Meat’s products are now available at more than 19,000 retail stores and restaurants nationwide, with the burger specifically available in the meat case at more than 5,000 grocery stores and on the menu at more than 4,000 hotels, college campus cafeterias and restaurants, including TGI Fridays, Veggie Grill and BurgerFi. The company employs more than 150 people. Entrepreneur spoke with Brown about his company and approach to innovation. There are a couple of ways to go about innovation. One is to raise a bunch of money, kind of hide away for a time then release a new product. I took the opposite approach. Every year we get better and better. We released that burger and I feel that’s the best thing we’ve ever done. We’ve already made that obsolete, because we’ve been working with our labs this year on an improved version of it. That’s just the cadence of the company. How do we relentlessly improve the products to the point where they’re indistinguishable from animal protein, and how do we go on a journey with the consumer so the consumer and the company are interacting with one another? We’re getting feedback from the consumer. We’re adjusting the products to react to that feedback, and it’s kind of a cycle that just keeps going until we create a perfect build of meat. That’s the right way to innovate. It takes some thick skin, because you put things out maybe a little too early and you get some feedback that’s not always nice. Does the company make enough sales from its consumer products to keep going, or is it the venture funding and other investors at this point? It’s both. We’re definitely venture funded, but if we shut down our research and development, we become a profitable company. Our research center here, called the Manhattan Beach Project, has global consequences. If you look at climate change as a real threat and if you look at heart disease, diabetes and cancer as a real threat, you should spend in a way that’s responsive to that. We do spend a lot of money on research and development, but we feel it’s worth it. What we’re going after is so central to not only the quality of the globe but the quality of each individual and the lives they lead. Do you see the company as a food company or do you see it as a research and development platform? It’s both. It’s a fascinating thing to innovate in the food space. There’s questions about what science can do and what science should do, and I think we always have to be cognizant of that. You can go out and create GMO products, you can create all kinds of artificial ingredients — but the consumer doesn’t want that. We have this really interesting tightrope we’re on: we want to use minimally processed foods, we want to use recognizable ingredients but at the same time it has to taste great and give the satisfaction of meat. Those are two diametrically opposed goals. We have to figure out a way to continue to consume meat but do it in a way that doesn’t involve the animal, because the animal is so detrimental to both the environment and has issues around human health that are important to recognize. That requires innovation, but it requires a tempered innovation and one that is cognizant of the fact that consumers aren’t going to be comfortable with something they don’t understand. Related: This Entrepreneur Said Yes Too Many Times. Then He Learned to Say No. Can you tell me something interesting about yourself that you think helped you launch and grow this business? I’m either sort of indifferent to or I love something. There’s no in between. So, I love what we’re doing — the cause and the mission — and think it’s critical. There’s a lot of passion and intensity around it. I don’t give up. I’m not afraid to fail. Do you think coming from an energy background instead of a food background has gotten you this far? I definitely look at technology as a solution. A guy like Michael Pollan, for example, will be like why don’t you get people to eat more vegetables? My own mother has asked me that before. To me, I know that we’re not going to win that debate. People love meat, and we’ve been consuming meat since before we were human. So I think the fix here is technological. We have to use technology to get us on a path to a solution. The second thing about coming from the energy sector is that I’m not afraid to spend a lot of money on research and development. Why are we spending so much money on lithium ion batteries for cars and so little money on creating plant-based meat? That’s a mistake, and we’re trying to remedy that. You change transportation and you can still get from point A to point B, but food is deeply personal. It’s a lot tougher conversation to have. It’s very intimate and it’s very much like, when you talk about transportation, some are partial to stick shift and others don’t care, but it’s not emotional. Talking about eating animals or not eating animals, it gets very emotional very quickly. If we were today to create a burger that is an absolute perfect build of meat, made it all from plants, there would still be cultural and societal headwind around completely switching from an animal protein to a plant-based protein, because we’ve evolved consuming animal protein and that’s safe. Part of evolution is avoiding things you don’t understand because they could kill you. So we have some of that residual conservatism in us as consumers. When people are disrupting technology spaces it’s very different when you’re talking about disrupting food, because food is so intimate. What is a strategy or tip that you have for new entrepreneurs? Don’t follow the herd. The problem with venture investing is there’s so much of that going on. Really marinate in the problem, try to figure out exactly what you’re trying to solve and how you uniquely can help solve that. Stick to a problem that you feel personal about because then you’ll work hardest to solve it.